Except for some pre-taped segments, the local news is often shot live, which can frequently lead to some awkward, amusing and totally emotional segments. 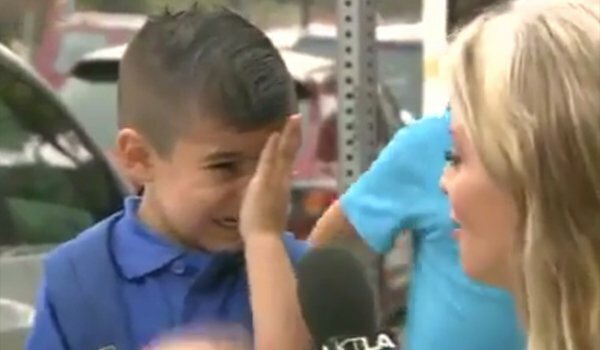 Recently, a pretty great local news moment happened when a KTLA reporter in Los Angeles made a 4-year-old pre-Kindergartener cry when she asked him the wrong question. You can check out the short segment, below. Going to school for the first time is both an exciting and rough day for young students. The four-year-old in question, Andrew Macias, seems pretty stoked when the reporter asks him whether or not he is “excited” for school to begin. He only gets one softball question, however, before she totally decides to jump into the hard questions, which in retrospect was probably a bad idea. Here’s what happened, next, when the reporter asked if the young man would be missing his mom on his first day of school. The poor kid tries to hold it together, vehemently denying that he will miss his mother before breaking into tears and covering his face. The reporter probably makes things worse by telling him not to cry (it’s that thing that some people do when they are already crying and told not to cry, which only serves to make them cry harder) before he turns tail and walks away. That is one kid who will definitely be missing his mother while at school. It’s simultaneously the saddest, bravest, cutest and most amusing thing you’ll see all day. Pre-kindergarteners aren’t exactly the poster children for emotional control. They are 4 years old, after all, and deserve to be given some slack. This kid’s particularly cute, because not only does he try to puff out his chest and be brave before he starts crying, his love for his Mamma is clearly evident. The kid reminds me of the one cute child who responded like a little angel the last time that Jimmy Kimmel had parents temporarily steal their kids’ Halloween candy. Anyone who has a kid like that is super lucky. Local news gaffes and bloopers happen all the time. Real life is weird, and we’re lucky the local news is still around to catch that weirdness. So, don't forget to tune in, because you never know what each installment of the local news might bring.